This is a free eBook for our readers. With the following tips, you will be able to make more informed decisions and avoid common hurdles that many experience when booking transportation. At Premiere Transportation, we have served some of the world’s top clients, from political campaigns, leading marketing agencies and event planners to Middle Eastern Royalty, Fortune 500 executives and Presidents of the United States. From our experience with transporting the most interesting people, businesses and causes across the nation, we’ve seen the most common problems in the transportation industry to the strangest outlier challenges—and everything in between. 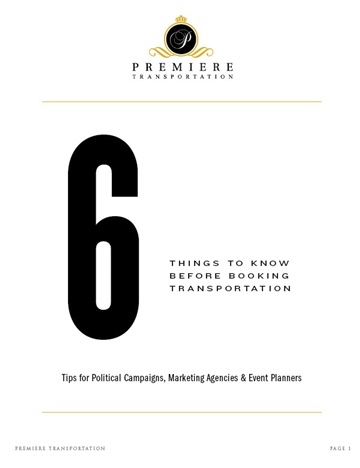 The following pages are a compilation of tips that we’ve picked up over the last decade that we believe can significantly help anyone in need of booking transportation for their next campaign, tour, or event.